Apple announced that it has committed to running all of its data centers and corporate offices on renewable energy, joining a group of other corporations committed to the same clean energy goal. Apple said it has joined RE100, a global initiative by influential businesses committed to using 100% renewable electricity. To date, RE100 has amassed membership from 77 corporations. Other RE100 members include Hewlett Packard Enterprise, VMware, Rackspace and Wells Fargo. Apple's announcement is mostly symbolic at this point. The company is already powering its operations in the U.S., China and 21 other countries with 100% renewable energy, and, in 2015, powered 93% of its operations around the world with renewable energy. Apple has invested in renewable energy for several years. Lisa Jackson, Apple's vice president for Environment, Policy and Social Initiatives, said Monday that the company completed construction on its latest renewable energy project — a 50-megawatt (MW) solar farm in Arizona, Apple worked with local utility Salt River Project on the solar array, which will provide renewable power to Apple's global command data center in Mesa, Arizona. The solar farm provides power equal to the energy use of more than 12,000 Arizona homes. 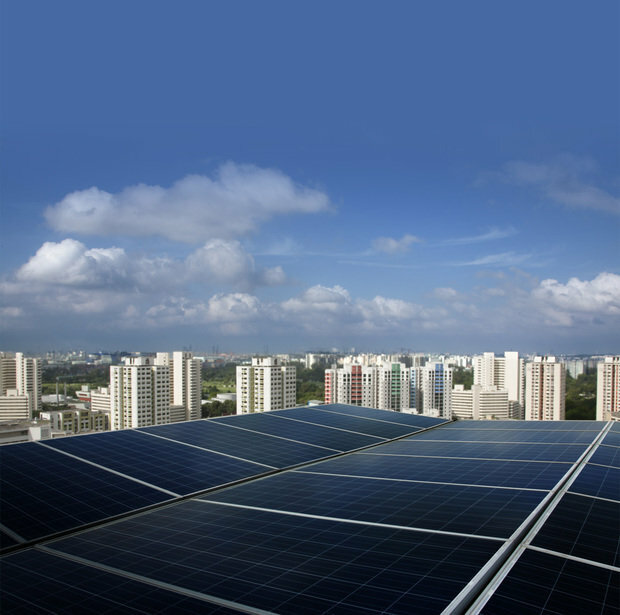 The Singapore solar project is the first distributed utility-scale installation in the country. Solar energy developer Sunseap Group will provide Apple with 100% renewable electricity from solar energy systems built atop more than 800 buildings in Singapore. Last year, Apple announced it would invest $850 million in a solar power plant through a partnership with First Solar, one of the nation's largest photovoltaic (PV) manufacturers and a provider of utility-scale PV plants. Through a 25-year purchasing agreement, Apple will get 130MW (megawatts, or million watts) from the new California Flats Solar Project. The First Solar deal rocketed Apple past Walmart as the largest corporate user of solar power. On the same day Apple joined RE100, Bank of America also announced it was committing to RE100. 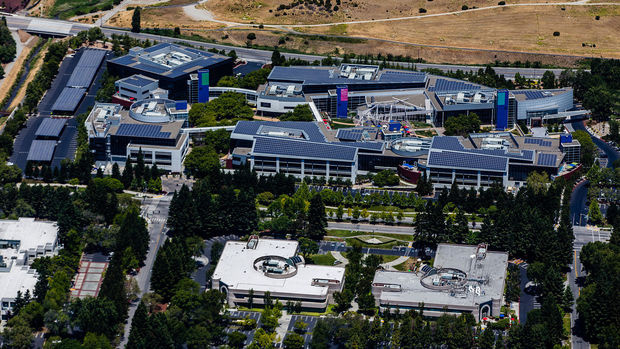 America's top tech companies have been going green in a big way, so much so that the availability of clean energy resources is a key consideration in where they locate corporate offices and data centers. The move is designed to save them millions of dollars in long-term energy costs. "We believe energy is the future of our business," Josh Henretig, director of environmental sustainability at Microsoft, said in an earlier interview with Computerworld. Last year, Google announced it would purchase 842 megawatts (MW) of clean energy, nearly double the clean energy it had already purchased -- taking the company to 2 gigawatts (GW) of clean energy. The Googleplex is Google's corporate headquarters in Mountain View, Calif. The company has committed to tripling its purchases of clean energy by 2025. Put in context, 1 megawatt (MW) can power roughly 200 homes, so Google's purchase could power about 168,000 homes. Google has pledged to triple its renewable energy purchases by 2025. Last year, Apple also joined with 12 of the largest companies in the U.S. to launch the American Business Act on Climate Pledge, a White House initiative to have corporations commit to reduce their emissions, increase low-carbon investments, deploy more clean energy, and take other actions to build more sustainable businesses and tackle climate change. Despite only being a few months old, the RE100 collaborative already boasts corporate signups from companies in India, China, Europe and the U.S.
"Research shows that in the U.S. alone, doubling energy productivity by 2030 could save $327 billion annually in energy costs and add 1.3 million jobs to the economy, while carbon dioxide emissions would be cut by approximately 33%," RE100 stated on its website. "We're happy to stand beside other companies that are working toward the same effort," Jackson said during remarks at Climate Week in New York City on Monday. "We're excited to share the industry-leading work we've been doing to drive renewable energy into the manufacturing supply chain and look forward to partnering with RE100 to advocate for clean-energy policies around the world." Apple is also a member of The Advanced Energy Economy (AEE), a trade association representing the renewable energy industry. "We're thrilled that Advanced Energy Economy member Apple has committed to run on 100% renewable energy and also sees the need to improve policy," AEE CEO Graham Richard said in a statement Tuesday. "They are upping the ante as they manage their energy needs, a trend we are seeing among our corporate energy buyer members." Last month, Apple glass supplier Lens Technology in Beijing announced it would run its Apple operations entirely on renewable energy. The clean energy commitment by Lens was combined with a zero waste compliance agreement for all of its final assembly sites. Solvay Specialty Polymers, which supplies Apple with antenna bands for the iPhone, also pledged to use 100% renewable energy for all of its Apple production. The commitment will cover 14 manufacturing facilities across eight countries by the end of 2018. Catcher Technology, one of Apple’s largest aluminum enclosure suppliers, also is targeting 100% renewable power for its production of Apple goods by the end of 2018. Altogether, Apple suppliers' commitments to date will represent more than 1.5 billion kilowatt hours per year of clean energy used in the manufacturing of Apple products by the end of 2018, equal to the amount of electricity consumed by more than 1 million Chinese homes.